All business operators can voluntarily request to the Health Ministry to make their premises a smoke-free area. Deputy Health Minister Dr Lee Boon Chye said once business operators make their premises a smoke free area, health officers could issue warnings to those who smoke there, even if the business premises may not be an eatery. ‘We have received complaints from other business operators saying that smokers who move three meters away from the eateries are smoking at their compounds. 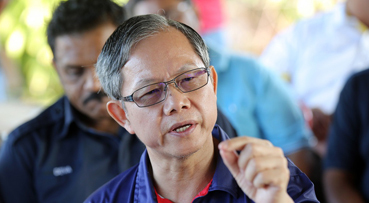 ‘For these business operators, they can always request to the Health Ministry and we will award them a blue ribbon,” he said adding that 100 business operators in Sabah were awarded with blue ribbon last week for voluntarily requesting their premises to be declared a smoke free area. Dr Lee said this at a press conference after launching the Tung Shin Cardiac Care Service held at Tung Shin Hospital here today.